Leonardo created futuristic inventions in a time before modern science and invention had really begun. He described and sketched ideas for many inventions hundreds of years ahead of their time. Artists and craftsmen in Leonardo's time knew how to build and repair the familiar kinds of machines. The idea of inventing new kinds of machines, however, would not have occurred to them. Leonardo developed a unique new attitude about machines. He reasoned that by understanding how each separate machine part worked, he could modify them and combine them in different ways to improve existing machines or create inventions no one had ever seen before. Leonardo's fascination with machines probably began during his boyhood. Some of his earliest sketches clearly show how various machine parts worked. As an apprentice in the studio of the artist Verrocchio, Leonardo observed and used a variety of machines. By studying them he gained practical knowledge about their design and structure. Leonardo set out to write the first systematic explanations of how machines work and how the elements of machines can be combined. His talents as an illustrator allowed him to draw his mechanical ideas with exceptional clarity. Five hundred years after they were put on paper, many of his sketches can easily be used as blueprints to create perfect working models. 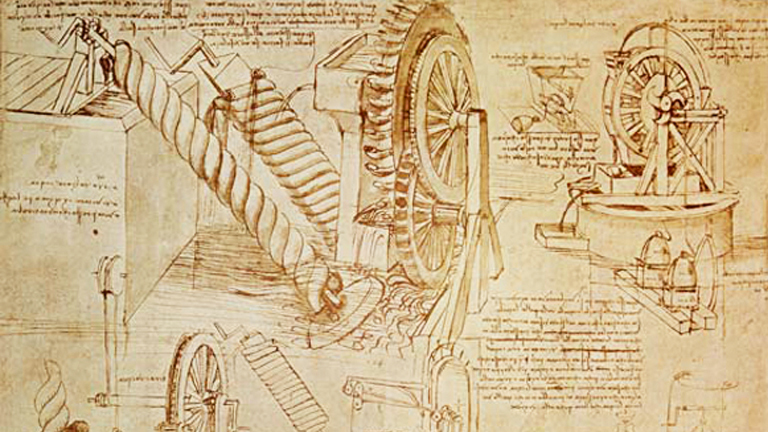 Leonardo described and sketched ideas for many inventions hundreds of years ahead of their time. But it seems the very few of these were ever built and tested during his life. Though his notes suggest that he wished to organize and publish his ideas, he died before he could accomplish this important goal. After his death, his notebooks were hidden away, scattered, or lost, and his wonderful ideas were forgotten. Centuries passed before other inventors came up with similar ideas and brought them to practical use. Imagine and design inventions to solve specific challenges, then create small working models to test and improve them. Identify and sketch the simple machines that are combined to create a gadget to better understand how it works. Browse Leonardo's machinery sketches and test your knowledge of which invention they eventually became. Write a message using Leonardo's mysterious backwards mirror writing style.